Info "You've got one shot to zap all your enemies!" Laser Lineup is one of Dribble and Spitz's microgames in WarioWare: Twisted! The purpose of the game is to zap and destroy all the orbs with one shot. 1st level difficulty: The orbs are in a straight line and stationary. 2nd level difficulty: The orbs are in a straight line, but they now move. 3rd level difficulty: The orbs are now scattered around. 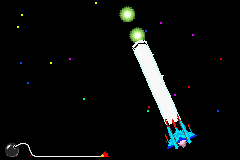 An extended version of the music in this microgame is used in the microgame Rocket Rotary. This page was last edited on April 3, 2019, at 20:08.